As he made his Budget Address in Parliament on Monday, January 9, 2012, Gonsalves stated that in three Divisions of the St Vincent and the Grenadines Community College (SVGCC), the female students greatly outnumber the male students. Gonsalves stated that in the Division of Arts, Sciences and General Studies, 71 per cent of the students are females, in the Teacher Education Division, 61 per cent of the students are female and in the Nursing Division there are 96 per cent female students. âThis is a worrying matter. Males are woefully under-represented at post-secondary and tertiary educational institutions,â Gonsalves said. The Technical and Vocational Education Training (TVET) division, Gonsalves said, had male and female students âalmost equal in their numbersâ, adding that over a three-year period, there has been an increase in the TVET Division, which reflects a growing market for TVET skills. Giving an outline of the enrollment at the four divisions, Gonsalves stated that there are 985 students at the Division of Arts, Sciences and General studies, with 839 in the CAPE and GCE âAâ Level programes and 146 pursuing Associate Degrees. In the Division of Teacher Education, 238 persons are enrolled, with 159 pursuing Bachelor Degrees in various specialties and the other 79 students specializing in Teacher Education, Gonsalves said. Additionally, he stated that in the Division of Technical and Vocational education there are 817 students, while in the Division of Nursing there are 189 students, with 160 in the Registered Nursesâ Programme. Gonsalves also stated that the programme expansion at the SVGCC over the past two years has been rapid, particularity with the evening programmes. 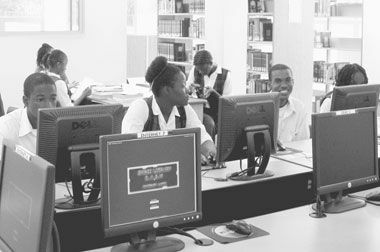 The programmes include degree programmes at the Teacher Education Division, on franchise agreements with the University of West Indies and the BA in Social Work degree, on franchise with the Jamaica Theological Seminary. Programmes also include four part-time Associate Degree programmes, at the Division of Arts, Sciences and General Studies which are in their second year, the Associate Degree Programme in Fine Arts, Design and Cultural Communications, which has been developed into a full-time programme. The Division also offers the Social Science Level One programme, on franchise agreement with the University of the West Indies.